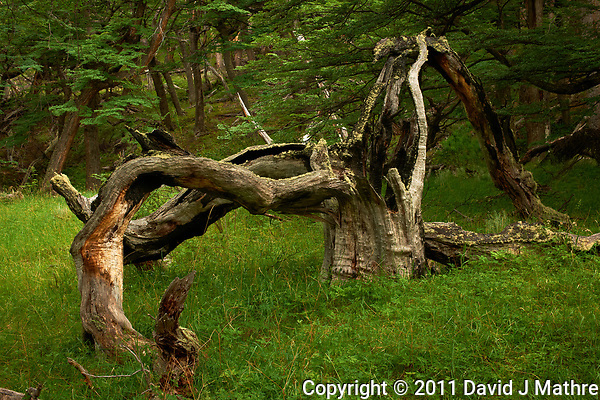 Gone to See Patagonia 2010/2011. Photography Workshop with Thom Hogan. Day 9: Hosteria El Pilar. Our final morning at Hosteria El Pilar. Unfortunately Mount Fitzroy was hidden behind the orange clouds. 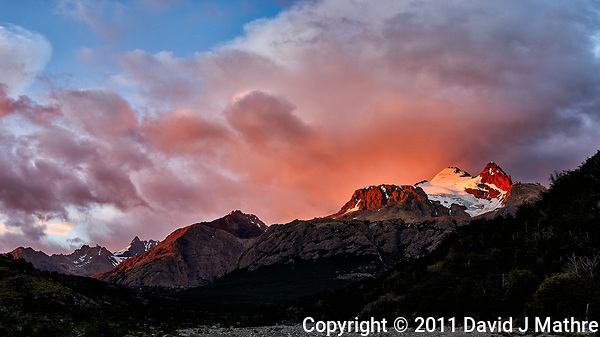 Patagonia dawn panorama. Composite of 5 image taken with a Nikon D3s and 50 mm f/1.4G lens (ISO 400, 50 mm, f/4) using Kolor AutoPano Giga Pro. 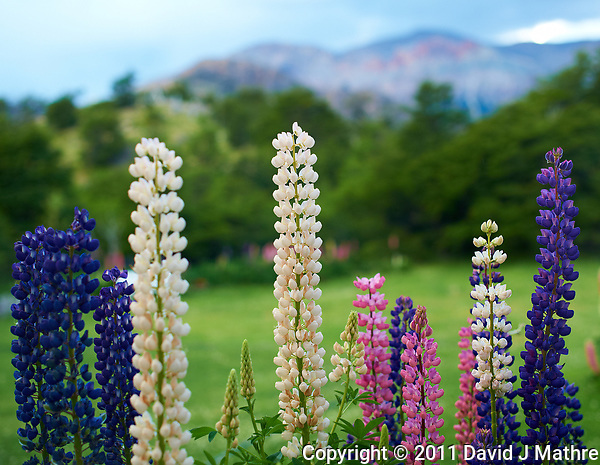 Later on one final image of the Lupine flowers. 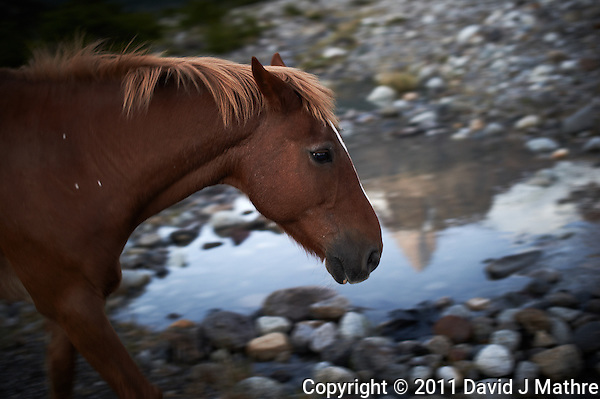 Image taken with a Nikon D3s camera and 50 mm f/1.4G lens (ISO 400, 50 mm, f/2.8, 1/250 sec). Then we were on the road to Perito Moreno Glacier. 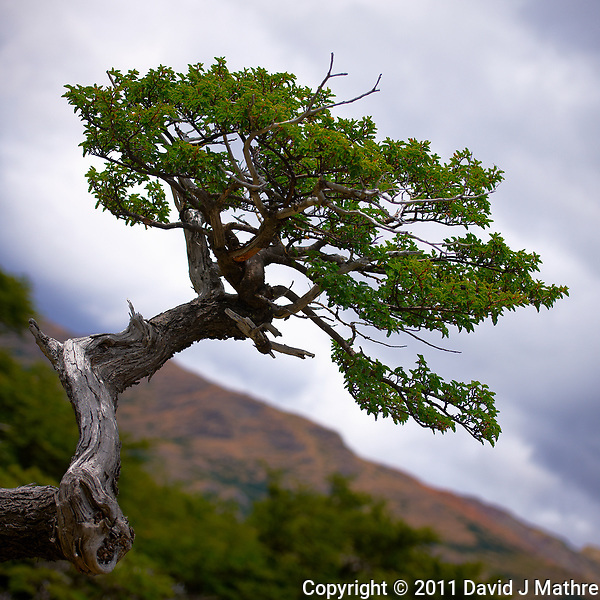 The weather in Patagonia is constantly changing. One thing our guide Rob told me was that he expected to see a rainbow every day. On the way back from our hike it started to rain, so we hightailed it back to Hosteria El Pilar. 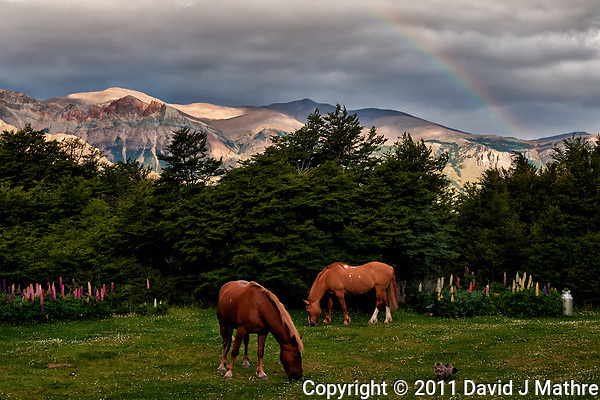 When we got there I saw these two horses grazing under a rainbow from the back patio. Image taken with a Nikon D3x and 50 mm f/1.4G lens (ISO 800, 50 mm, f/5.6, 1/320 sec). Trees in Patagonia along the trail from Hosteria El Pilar to Laguna Torre. 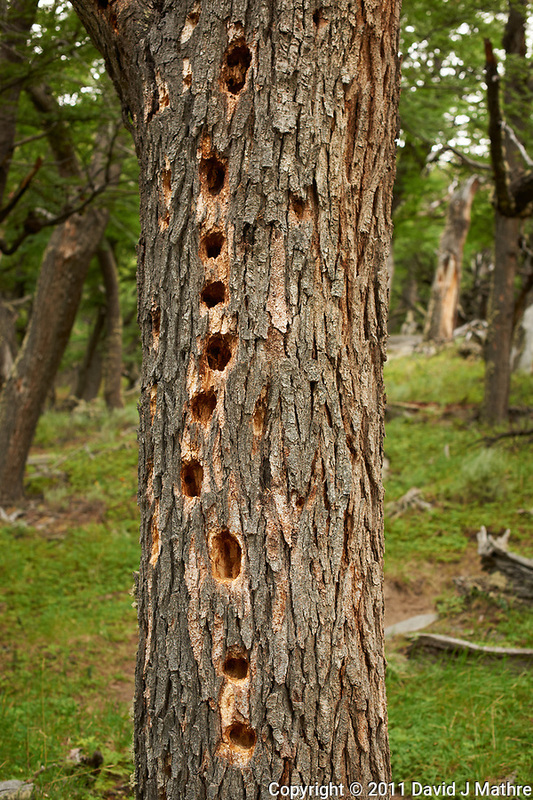 Many of the trees in Patagonia are distorted by the constant wind always coming from the same direction, one struck by lightning, and one drilled full of holes by Magellanic Woodpeckers looking for grubs. Gone to See Patagonia 2010/2011. Photography Workshop with Thom Hogan. Day 7: Hosteria El Pilar. 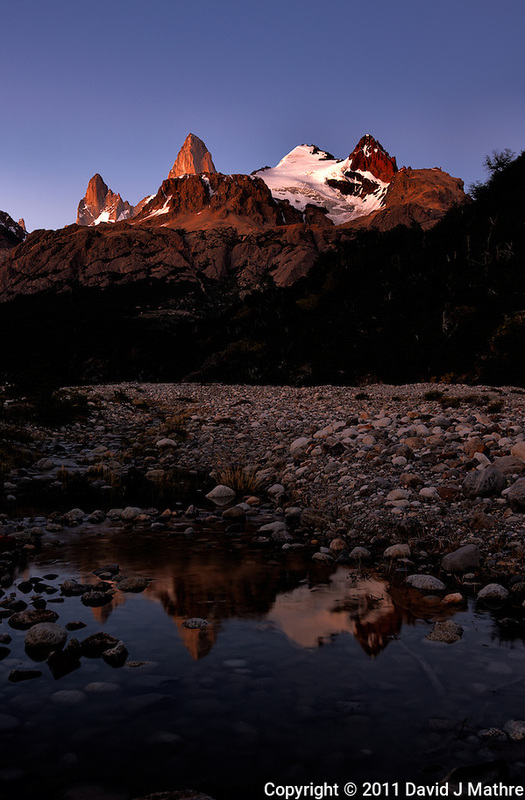 Patagonia dawn and reflections of Mount Fitzroy from Hosteria El Pilar in El Chalten, Argentina. At one point, a horse showed up to have its picture taken. 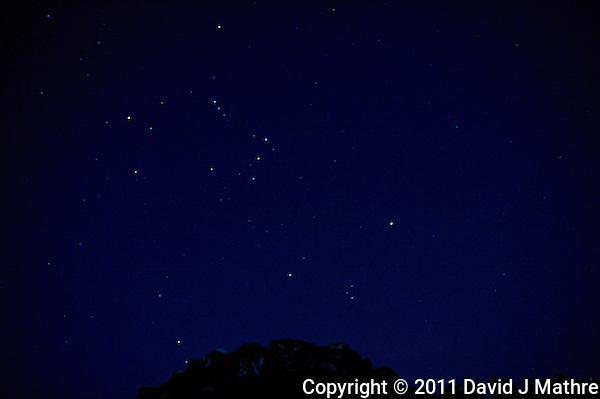 Orion is upside down in the southern hemisphere. A dark night sky in Patagonia. Hosteria El Pilar, El Chalten, Argentina. Image taken with a Nikon D3s camera and 50 mm f/1.4G (ISO 12800, 50 mm, f/2, 1/15 sec).